A spanner wrench, also called a crescent wrench, is a versatile tool. The adjustable head allows you to tighten and loosen a variety of sizes of nuts. For example, if you are working on a project that includes 3/16-inch bolts and 5/16-inch bolts, you can use the same wrench on both sizes of bolts rather than switch wrenches. Spanner wrenches come in a variety of sizes, and you need to have the right size wrench for the job. Measure the shaft. Spanner wrenches come in various sizes from 4 inches to 18 inches in length.To determine what size spanner wrench you have, measure from the end of the handle to the edge of the fixed side of the vise. Some spanner wrenches have the size printed on the handle. Set the opening. In order to tell if your spanner wrench is open wide enough for the bolt you wish to work on, measure from the inside of the adjustable side of the vise to the inside of the fixed side. Select the right size for the job. Smaller spanner wrenches do not open as wide as larger ones and cannot be used on large bolts. Measure the bolt width, then open your spanner wrench as wide as it will go and measure the gap between the insides of the vises as above. If the bolt is wider than your spanner wrench can open, you will need a larger spanner wrench for that job. Using the wrong size spanner wrench for the job can cause the tool to slip, resulting in scraped or bruised knuckles. 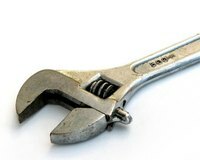 What Is a Spanner Wrench Used For?